RULE #1 ALWAYS judge proper fit ON a motorcycle, or in riding position. RULE #2 If it's too comfortable, it's probably too big. RULE #5 Leather should always start out snug so it can stretch and break in comfortably. 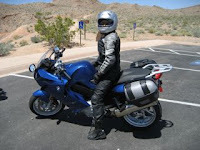 My list includes everything you should be wearing when on your motorcycle: Full face helmet, jacket, gloves, pants and boots. It's like having me right in your back pocket! I've also included a few tips for each type of item to help you make your decisions. Whether it's at the show or on your own at your local shop, I hope this will help you make a well informed decision on what to buy and how to shop for it. I'll be at the IMS this weekend, mostly hanging out at the Women's Center booth giving gear seminars. I'll be tweeting my whereabouts, if you would like to know where I am! If you still need discount tickets, use Christina Shook's promo code "COB" online through the IMS website. Thanks Christina!! And finally, don't forget to tune in tomorrow, Tuesday November 17th at 4pm Pacific to listen to a special local edition of SideStandUp with me and Carla co-hosting the show with local Bay Area guests! And what do I see? LOAFERS. UGLY, DARK RED LOAFERS WITH TASSLES! Tassles?? Really? You went to all that trouble, shelled out fifteen grand on a bike, helmet, a one piece and then you finish off with LOAFERS?